A pizzeria close to Sydney’s CBD is trying to lure customers who have had too much to drink with a bold advertising campaign using public transport as the medium. 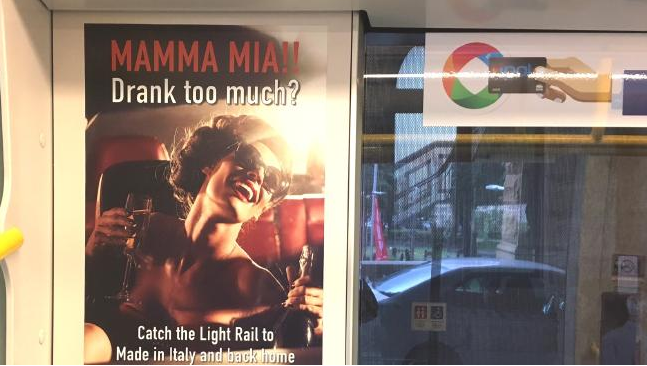 Made in Italy’s ads have recently appeared on Sydney’s light rail network, according to news.com.au, which feature an image of a woman looking rather tipsy and wearing sunnies, complete with a champagne bottle in one hand and a full flute of bubbly in the other. The pizzeria happens to be only a short distance from The Star casino in Pyrmont, which sits just outside of Sydney’s controversial alcohol lockout zone. John Brookes, treasurer of local residents group Pyrmont Action, told news.com.au he was not impressed that a licensed premises was trying to woo sloshed customers to a part of the suburb that was generally lacking in late night venues. “The Star is actually quite far from most residential parts of Pyrmont, and in general, there’s not a lot of overflow, but if they’re trying to bring that away from the Star, that’s not a happy thought,” he said.